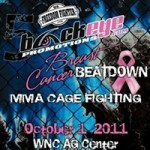 BlackEye Promotions brought female fighters to the forefront at BlackEye Promotions 5: “Breast Cancer Beatdown” tonight in Fletcher, North Carolina. The charity fight card was headlined by a 125-pound women’s bout between Roxanne “The Happy Warrior” Modafferi and Barb “Little Warrior” Honchak. Also on the card, Canadian residents Charmaine “Not So Sweet” Tweet and Anna Barone squared off in a 155-pound matchup, while prospects Chelsea “The Italian Princess” Colarelli and “Little” Patricia Vidonic did battle at 115 pounds. MMARising.com has live play-by-play for the BEP 5 main card. Punches were exchanged early on and Modafferi clinched, but gave up her back. Modafferi turned into the clinch and Honchak landed knees to the body. Modafferi took Honchak down and landed in the scarf hold position. Honchak scrambled and managed to take Modafferi’s back again. She tried for a rear-naked choke, but Modafferi countered with a Kimura attempt. Honchak stayed on Modafferi’s back and freed her arm from the Kimura. Modafferi tried to turn into Honchak’s guard, but Honchak swept to mount and landed short elbows. She transitioned to an armbar, but Modafferi held on and defended until the bell. Good opening round. 10-9 Honchak. Modafferi threw a Superman Punch in round two and Honchak slipped. She regained her footing and Modafferi clinched. Modafferi tried to pull guard with a guillotine choke, but Honchak stayed on her feet and landed a knee. Modafferi tried to throw Honchak, but Honchak easily defended. She reversed Modafferi’s next takedown attempt and wound up on top. Honchak threw short punches and elbows from Modafferi’s guard and postured up. More elbows landed for Honchak, but Modafferi managed to block some of the strikes. Modafferi tried to set up an armbar, but Honchak kept her down and moved to side control. She landed two elbows and a hammerfist to close out the round. 10-9 Honchak. Modafferi looked to clinch in round three and the fighters traded punches. Honchak pressed Modafferi up against the cage and threw knees and right hands to the body. She landed a standing elbow and reversed a takedown from Modafferi. Honchak landed in mount, then took Modafferi’s back and scored with punches. Honchak secured a rear-naked choke and Modafferi tapped out. Winner: Barb Honchak by Submission (Rear-Naked Choke) at 1:46 of round three. She improves to 5-1-0. Tweet clinched early on and landed a knee to the body, but Barone countered with looping punches over the top. She rocked Tweet with a hook and dropped her with a big right. Barone followed with two more punches on the ground and Tweet was briefly unconscious. Winner: Anna Barone by KO (Punches) at 0:18 of round one. She improves to 2-2-0. After an early punching exchange, the fighters clinched and Colarelli landed a knee and a flurry. Colarelli connected with two more knees and standing elbows. Vidonic threw leg kicks and landed a nice knee of her own. Colarelli continued to find a home for standing elbows to the sides of Vidonic’s face, but Vidonic backed her up with a lengthy combination. Vidonic landed leg kicks and the fighters began to trade standing elbows in a clinch. Both landed and Vidonic mixed in knees to the body. Vidonic took Colarelli down against the fence and threw punches to the head and body. She postured up and landed punches, hammerfists and two elbows before the end of the close round. 10-9 Vidonic. Vidonic took Colarelli down in the second round and worked to set up a submission with strikes from the top. She secured a modified rear-naked choke in a scramble and transitioned to an armbar soon after. Colarelli remained calm and spun through. She wound up on top in Vidonic’s guard. Vidonic quickly looked to set up a triangle choke, but Colarelli avoided it and threw short punches. Vidonic locked on the triangle and rolled over to mount. She rained down punches, but Colarelli escaped out the back. Vidonic took her back and secured a rear-naked choke that forced Colarelli to hastily submit. Winner: Patricia Vidonic by Submission (Rear-Naked Choke) at 4:04 of round two. She improves to 5-1-0. Punches were exchanged early on and Gomes landed a body kick. She scored with a one-two and took Smith down. Gomes passed Smith’s guard and landed punches and hammerfists. She nearly secured a rear-naked choke in a scramble, but Smith fell to her back to escape. Gomes spun into a heel hook and Smith punched to escape. The fighters stood and both landed jabs. Smith flurried with punches late in the round. 10-9 Gomes. Smith stuffed a takedown in the second round and landed punches that kept Gomes on the outside. Smith jabbed and fired off a combination to the head and body. Smith remained effective with quick punches and an uppercut, but Gomes took her down. Gomes postured up and struck from half-guard as the round progressed. Smith tried to get to her feet, but was blasted by an illegal knee and punches. The referee did not warn or punish Gomes. 10-9 Smith despite the late rally. The fighters punches in round three and Gomes dropped Smith with a left hand. She tried for an armbar and a triangle choke on the ground, but Smith escaped and stood up. Smith landed a nice right cross and Gomes answered with another left. Smith landed kicks, but Gomes took her down against the cage. She worked from the top with short elbow strikes and punched to the body until the final bell. 10-9 Gomes. Winner: Ediane Gomes by Unanimous Decision (30-27, 30-27, 29-28) after three rounds. She improves to 8-2-0. Davis countered early punches from Wright by taking her down. She landed in mount and tried for a top-side guillotine choke. Wright defended, but Davis unloaded with punches and elbows. Wright rolled over as Davis flurried with more punches and the fight was stopped. Winner: Amy Davis by TKO (Punches) at 1:03 of round one. She improves to 2-2-0, 1 NC. Coleman landed counter right hands that kept Schneider on the defensive, but Schneider managed to close the distance and scored a takedown. Schneider threw short punches from the top and Coleman elbowed from the bottom. Schneider spun for a heel hook and Coleman punched free. She nearly took Schneider’s back, but Schneider wound up on top. Again, Schneider worked for a heel hook and Coleman escaped again. In a scramble, Schneider locked on an armbar and flattened Coleman out on her stomach. Coleman tapped out. Winner: Sarah Schneider by Submission (Armbar) at 4:30 of round one. She improves to 5-5-0. The fighters traded big punches and knees to open the fight and Buck scored a takedown against the cage. He landed elbows from the top, then postured up and threw punches. Heink, bleeding from the top of the head, tried to stand up, but Buck rocked him with a hard right hand. Buck threw elbows from the top in side control and looked to set up a guillotine choke. Heink got to his feet, but ate knees in a clinch. Heink landed knees in close and the fighters traded punches in the final 30 seconds. Buck took Heink down before the bell. Close round. 10-9 Buck. Buck took Heink down in round two and threw short punches from the top. He moved to half-guard and tried to get to side control, but Heink defended well. Heink scrambled to his feet and Buck slammed him down. Buck landed punches and easily avoided a heel hook attempt. He moved to the back and threw punches, then returned to Heink’s half-guard. Short punches and elbows scored for Buck in the final seconds. 10-9 Buck. Buck once again took the fight to the ground in the third round and worked from the top. He kept Heink pinned down from half-guard and side control and landed punches and elbows. Heink attempted to scramble out, but Buck had none of it and landed more short strikes. Buck continued to pepper Heink with punches and alternated between half-guard and side control until late in the round. He landed a salvo of elbows before the bell. 10-9 Buck. Winner: Johnny Buck by Unanimous Decision (30-27, 30-27, 30-27) after three rounds. He improves to 9-8-0. Cortez scored a takedown early in round one and worked from Tran’s guard against the cage. Tran attempted to set up an armbar as Cortez threw short punches. Tran switched to a heel hook attempt, but Cortez landed more punches. The fighters stood and Cortez took Tran back down. Tran attempted a Kimura and Cortez fought out with knees to the body. 10-9 Cortez. Cortez wasted little time in taking the fight back down to the mat in round two. Tran worked for another Kimura and Cortez landed knees to the body. Tran regained full guard and torqued back on the Kimura, but Cortez managed to pass back to half-guard and escaped danger. Tran maintained his grip, however, and a stalemate ensued. The fighters were stood up and Tran fell after throwing a kick. He stood and Cortez took him down. Tran countered and took Cortez’s back. He tried for a rear-naked choke, but time expired. 10-9 Tran. The fight returned to the mat in round three and Tran took Cortez’s back. He methodically worked for a rear-naked choke, but was unable to pass Cortez’s defence. Tran spun and transitioned into a triangle choke. Cortez fought it and tried to escape, but Tran tightened the choke and Cortez was forced to submit. Winner: Matthew Tran by Submission (Triangle Choke) at 3:43 of round three. He improves to 3-1-0. The fighters teed off with punches right away and Jones rocked Greenway with punches and a knee. He threw Greenway to the mat, but Greenway stood and clinched. He landed a knee that strayed low and time was called for Jones to recover. Action resumed and Jones took Greenway down right into mount. He tried for an armbar, but Greenway escaped and secured back control. The fighters stood and battled for position in a clinch. Jones threw Greenway to the mat and wound up on top in side control. Greenway regained guard and Jones struck from the top. Greenway scrambled to his feet and Jones teed off with punches and a head kick. Big power shots landed for both fighters, but they remained on their feet. 10-9 Jones. Greenway badly rocked Jones with a spinning backfist in round two and tried for a takedown, but Jones reversed and Greenway injured his arm on the way down. The fight was immediately stopped, giving Jones the TKO victory. Winner: Tommy Jones by TKO (Arm Injury) at 0:41 of round two. He improves to 1-0-0. Rudloe dropped Alberico with a knee right away and landed punches on the ground. He moved to side control, but Alberico regained half-guard and secured an arm-triangle choke from the bottom. Rudloe could not escape and was soon rendered unconscious. Winner: Vincent Alberico by Technical Submission (Arm-Triangle Choke) at 0:55 of round one. He improves to 1-0-0. Ashley Greenway defeated Danaea Makemson by Submission (Guillotine Choke) at 1:09 of round one. Dudley Spence defeated William Bratz by KO (Punches) at 1:50 of round one. Jason “The Nightmare” Faglier Jr. defeated “Flyin'” Ryan Conn by Unanimous Decision (30-27, 30-27, 29-28) after three 3:00 rounds. Kodey Gulley defeated Nathan McCall by Submission (Rear-Naked Choke) at 2:00 of round two. Leonardo “Danger” Perez defeated Daniel Duge by KO (Punch) at 2:47 of round one. Dustin Messer defeated Doug Bishop by Submission (Rear-Naked Choke) at 1:31 of round one. Sorry that Roxy lost her fight:-(.